But naturally we floated the idea anyway and apart from two grand-daughters in London who couldn’t get away, they all said Yes. So nineteen of us rolled up at Wyndham Resort Denarau Island for what turned out to be a marvellous Christmas gathering. It was a big advance on our first visit in 2010 when Vanessa and I came, just the two of us, to celebrate our 50th wedding anniversary. For reasons of age, we requested accommodation without steps for us and the Wyndham staff allocated a perfectly-located garden-view ground-floor apartment. So for the whole time we were there, day and night, we had family members wandering in and out at leisure, stopping for a chat or a cuppa or a shared meal. We all live in different States so this was a rare and wonderful experience. Vanessa brought a 1000-piece jigsaw puzzle. I think everyone had a go at it at least once and at times there were four or five people sitting around the table trying desperately to complete it before we left (we didn’t). On Christmas Eve, the resort singers presented carols around the pool. The next morning we all went to a local church and although we mistook the time and arrived late, there were no complaints when our group of 19 extra people turned up for what proved to be a really inspiring service with stirring preaching (helpfully in English), inspiring a cappella singing and a friendly Bula welcome. On the following Sunday, there was a small gathering in the resort where three local people led a simple warm-hearted church meeting. For many years Wyndham has been the only resort in Denarau Island to offer such a valuable service. 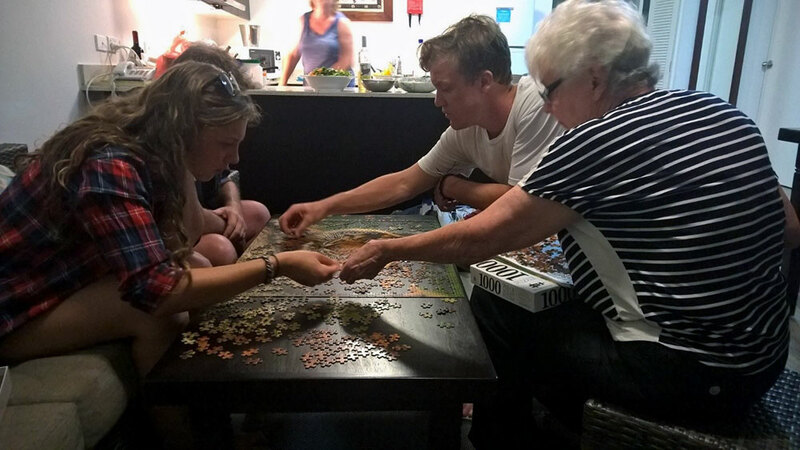 Teamwork – family members working to complete a 1000-piece jigsaw puzzle. Wyndham Resort Denarau Island serves a wide variety of food and drink, with exciting evening entertainment, including brilliant fire-dancing. The young people enjoyed the many opportunities for activities, especially swimming and sailing; we older ones loved the relaxed restful atmosphere. My wife and two of her grandsons participated in a family golf championship. My son Luke and I would have played tennis if I had not injured my leg just before leaving home. We all loved the tours and cruises available. Luke took a Wilson volleyball with him to Castaway Island so he could emulate Tom Hanks! And a big highlight – our oldest grandson Joseph brought Jayne as his girl-friend but took her home as his fiancée: they announced their engagement during the holiday. Exciting! The Wyndham staff were friendly and helpful – from management to maid, they were all smiles and good cheer. And the grounds were constantly kept clean, tidy and spotless. The place is idyllic. We are already thinking about our third visit. Who knows who will come with us next time? This entry was posted in (Fiji) Denarau Island and tagged Denarau Island, family, Fiji, holiday, timeshare, travel, vacation ownership, WorldMark South Pacific Club by Wyndham, Wyndham Vacation Resorts Asia Pacific. Bookmark the permalink.